The "Session Bass" ... A singular item for a plural bass! Do you often need more than one bass? Don't ask yourself anymore... just think the easiest choice: Pick them all! • At first... Give an answer to a customer’s demand: as most often by the starting of such a project there is a wish, sometimes the need of something that doesn’t exist. Here I had to design a range of instruments that could simplify studio recording works. A removable part under the string would allow changing the pickups configuration upon the requirements of the differents recording sessions. The first item was one four strings fretted bass and one fretless, then later, if everything is working well enough... one six strings guitar! Such were the recipient wishes. • And what about electronics?... 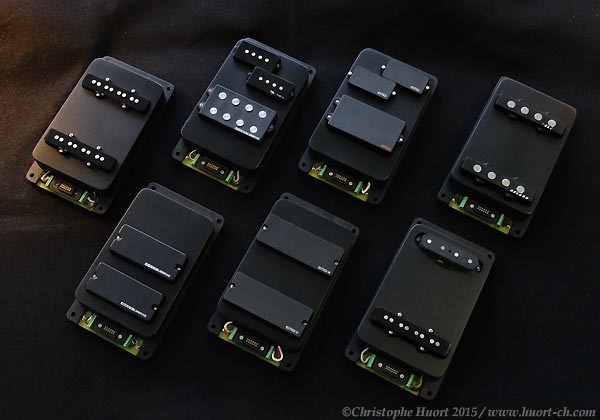 What an important issue as the goal is to use any kind of pickups like vintage or modern, single or humbucking styles and even passive or active! So the internal schematic must offer the facility to split an humbucker coil or lead it in both parallel or serial switching modes, but this switch must be automatically enabled when changing the module... and without any other intervention! • And as we're going to lay a new project... Starting from a specification list already full, I decided to see beyond trying to imagine modules extractable through the back of the instrument so it would not be necessary to de-tune or dismantle any part of the instrument. Using carbon reinforcements to minimize any deformation due to the significant removal of material changing your pickups configuration is now possible in less than one minute! • Finally... Left to take the game, the last question was about that possible use on stage. No need to remove or change pickups during a live performance but the instrument must display a certain aesthetic... No way to exhibit one of these prototypes looking like Frankenstein! Thus was born the "Session Bass": A luthier's masterpiece? By one way certainly. As I consider that "Luthier" mean at the same time meet the customer's requirements, his wishes, and also be able to look beyond a request until I can finally make the reality more beautiful than the dreams. The Session bass comes as 4 or 5 stringed versions, fretted or frettless. Headless versions are available. Both right or left handed Starter offer includes two basic* modules . Hardshell included. Send your contact and location information to get a personal quote for custom item. Do not hesitate to contact me for more custom specifications. Delivery: approx. 4 months form receipt of confirmation (depends on workshop charge at the moment). • Your choice: ask for others custom positions.